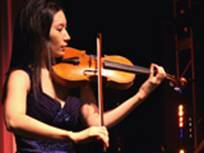 Michelle Kim started playing violin at the age of six and made her Los Angeles debut at age ten, playing Vivaldi's Violin Concerto with the Los Angeles Youth Orchestra. She has won numerous competitions resulting in solo performances of major works such as the Tchaikovsky and Sibelius Violin Concertos with orchestras in Los Angeles, Berkely, and New York. In fall 2003, Michelle joined the Washington National Opera Orchestra after graduating from the Manhattan School of Music in May of the same year. Besides Masters degree in Music, she holds Bachelors degree in Statistics from UC Berkeley.